Eram Educational and Welfare Trust is based at Prabhapuram, Mannengode P.O (Pin: 679307), Palakkad District, Kerala State, India. The trust is formed as part of the CSR initiative of Eram Group of Companies. The trust is focusing on the activities in education sector as running the schools, empower the students with professional training and establish centre for excellence. The trust is undertaking other activities as well like medical camps for community, educational awareness programs, livelihood initiatives etc. to support the people around. MMPS (Mariyumma Memmorial Public School) and EASE (Eram Academy for Sports and Excellence) are two major initiatives under the Trust. This is an ambitious venture by Eram Group to bring quality and holistic education to the underprivileged students in India. In an attempt to help revive Bharathappuzha, the second longest river in Kerala, which has almost become a dry sand bed, the Eram Group took the initiative to replace the broken wooden shutters of the causeway, connecting Mankara and Kottayi panchayats on both sides of the river, with iron ones. The initiative has helped stop the flow of water, causing the water level on that part of the river to rise. It was following media reports about the collapse of the shutter that Dr. Siddeek Ahmed, MD, Eram Group has expressed his willingness to help replace the old broken shutters with new solid iron shutters. The chiefs and members of local bodies as well as Eram Group representatives, who were present, led the initiative. Kochi: Eram Group is backing the Kerala Government's initiative to make Kerala India's first Open Defecation-Free State, by distributing financial aid to families in five districts of north Kerala for building toilets. A K Balan, State Minister for Law, Culture and Welfare distributed the grant meant for 242 BPL (below poverty line) families to the local body chiefs of Mankara, Mannoor, Pirayiri, Parali and Kottai panchayats in Palakkad district, at a function held at Mankara recently. The Minister praised Eram Group's yeomen services towards supporting the welfare initiatives of the government. Dr. Siddeek Ahmed, CMD, Eram Group presided over the function which was also attended by M B Rajesh MP, Shafi Parambil MLA and T R Ajayan, secretary Swaralaya.
" The panchayats submitted detailed reports which were vetted by our expert team, and based on their detailed evaluation and recommendations, we shortlisted five and disbursed the funds," informed Dr. Ahmed. For numerous Malayali expatriates who are spending jailtime in the gulf with no legal or financial support, the ‘Swapnasafalyam’ project is a ray of hope. This is an initiative by NORKA, the Non Resident Keralites Affairs Department set up by the Kerala State Government to help those who have been jailed in various gulf countries for reasons beyond their control, and are unable to return home even after serving their time in prison. Under the leadership of Dr. Siddeek Ahmed, ITL World is extending its support to this much needed initiative by sponsoring the tickets for their return home. Many have already been happily reunited with their families through this project. In addition to constructing homes for the poor, many areas of Palakkad district have also been provided complete drinking water solutions. This includes not just the provision of a water source, but an end-to-end system which includes drilling borewells and building tanks to the necessary plumbing to make clean, drinking water available to each house in the locality. Special teams have been delegated for the effective execution of these projects. One of the key social concerns of Eram Group is public sanitation. Lack of proper sanitation facilities causes dire health concerns including severe kidney diseases for an alarming number of people in India. Women especially suffer the worst, and countless children die every day due to unhygienic conditions. Concerned by this alarming trend, Dr. Ahmed initiated a Dialysis Project under which dialysis machines and medical aid have been provided for the benefit of numerous patients who suffer from severe kidney diseases. However, the effort does not stop there. The R & D wing of Eram Group developed an award-winning product called the eToilet to prevent this issue in the future. Today, these self-sustainable, self-cleaning eToilets have been installed in various public spaces across India. These eToilets require little to no maintenance and can be used by the public for free or for the cost of just one rupee. This is a huge step taken towards achieving the vision for a better future free of problems caused by improper sanitation. 13 year old Anish from Kerala lost his right hand in a bus accident on his way home from school. Anish, who was an active football player and captain of the regional football team was no longer able to play as he used to. His family could not afford expensive treatment and Anish had to learn to cope with the loss of his dominant hand. Today, he has an artificial, battery operated hand from healthcare company - Ottobock with the support of Eram Group Chairman, Dr. Siddeek Ahmed.Anish’s story is one out of many such incidents. An ardent philanthropist, Dr. Ahmed has consistently used his success to support numeroussuch families in need. A passionate sports lover, Dr. Siddeek Ahmed has been consistent in recognizing young talent from his country, and encouraging them with the support they need to compete on a level playing field. When athletes P U Chithra and Mohammed Afsal from Palakkad district (Kerala, India) won gold at the National Schools Games, Dr. Ahmed was elated to offer sports kits consisting of international quality to the young champions as well as 36 others who qualified in the games. Since then, the young athletes have already validated his faith in their potential by going on to win many more medals at national and international arenas. Diljith T S, the motor racing and karting champion from India is another young talent whom Dr.Ahmed has keenly supported. With several wins under his belt already, Diljith is known to dominate the race tracks he competes on and seals championship titles at almost every race. Among other community service activities, Dr. Ahmed has also had over 50 houses constructed to offer shelter to homeless families. Another 25 houses are currently under construction. Each house is constructed with an area of no less than 600-1000 square feet to ensure that they provide comfortable, feasible and lasting shelters rather than perishable quick-fixes. Ever sensitive to the struggles of Indian expatriates in the Middle East, Dr. Siddeek Ahmed has played an instrumental role in the joint initiative by Navodaya Cultural Centre, Dammam (Saudi Arabia) to arrange a chartered flight from Dammam to the Nedumbassery airport in Kerala, India. More than 100 flight tickets were distributed in October, 2013 to victims of Nitaqat. Nitaqat is the new labour law in Saudi Arabia due to which many faced severe employment and visa complications. At a time when even the government failed to come to their support, this initiative came as a huge breath of relief to the many victims. In association with Lions Club International, Eram Group has organized 30 medical camps across the Ottappaalam and Kongand legislative constituencies as well as tribal areas like Nelliyampathi in Palakkad district, Kerala. This project has seen the completion of 4000 cataract surgeries across 30 Panchayats in 4 years. In addition to this, Eram Group has also sponsored ambulances to many NGOs and Panchayats in and around Palakkad to attend immediately to medical emergencies. Kochi: The Saudi Arabia-based Eram Group has set up a new hi-tech children’s clinic at Mankara Government Hospital in Palakkad district as part of its social responsibility initiative. A K Balan, Kerala Minister for Law, Culture and Parliamentary Affairs, inaugurated the hospital building on October 31 in the presence of Dr.Siddeek Ahmed, Chairman and Managing Director of Eram Group. A native of Mankara, Dr.Siddeek Ahmed has built the new section as a memorial to his late mother Maryumma. 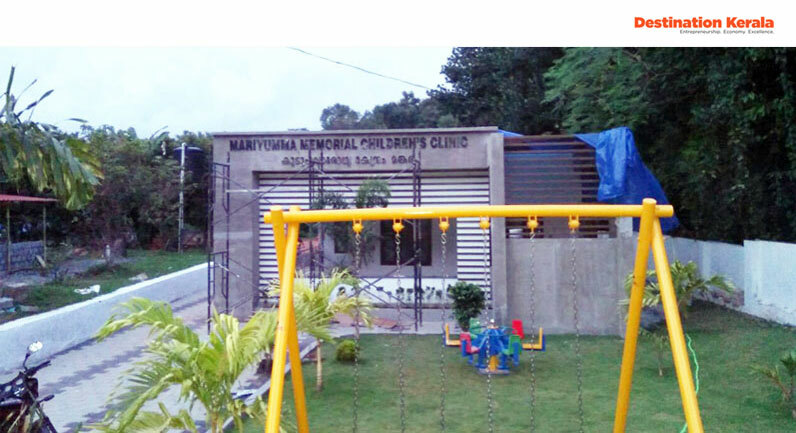 The clinic will be renamed as ‘Maryumma Memorial Child Clinic’. Built to provide a calm and peaceful environment for children, the beautiful and compact building is suitable for multiple usages. The floors and walls are decorated with multi-coloured tiles and soothing paint. The hospital consists of office, rest room, lab, a treatment room, injection room and doctor’s examination room. The other facilities include a play area with swings, playground and carpeted greenery. The agreement was entered into in 2015 with the panchayat for setting up the clinic. The consent for the clinic was sought by the panchayat as it involved private investment in the government sector. Dr. Siddeek Ahmed said the setting up of the clinic for children was encouraged by the fact that his mother was a loving and caring person, who loved children very much. He said that love and compassion for fellow beings are just a few of the good things that his mother taught him.